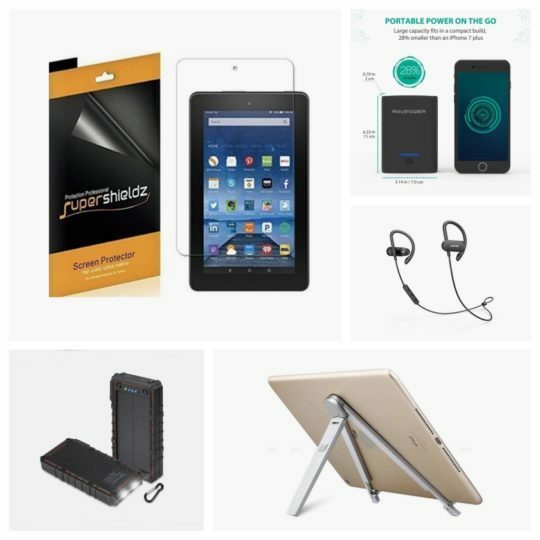 Find below the most attractive Cyber Monday 2017 deals on e-readers, tablets, accessories, and digital content. This simple guide is designed to let you go through the most attractive deals offered before, during, and after this year’s Black Friday and Cyber Monday shopping peak. You will have a chance to see offers from different online stores, not only Amazon, but also Best Buy, eBay, or Barnes & Noble. Obviously, our main interest is in mobile devices and digital content. 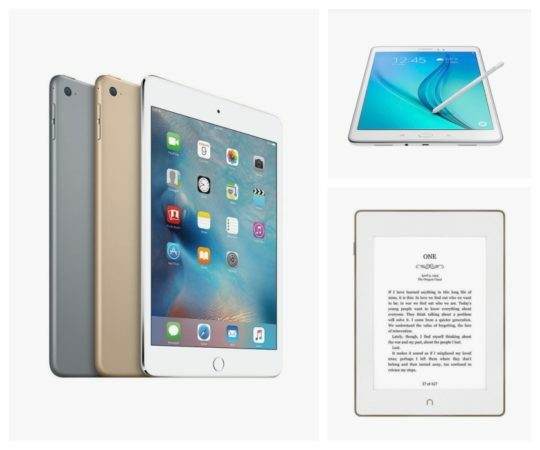 You will see here the deals and special offers for Kindle, Fire, and iPad lovers followed by the biggest deals on other tech-related items. 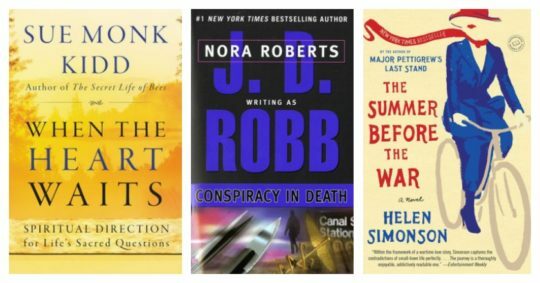 other deals – Cyber Monday sale from Kobo, Nook, eBay, Best Buy, and other online stores. Tip: This article is long. If you want to find the product quickly, you can use your browser’s built-in search feature. On a PC, use the shortcut Control+F, and type the keyword. On a Mac computer, hit Command+F. We are updating the guide every time a new attractive deal or special offer is launched. Come back here for the updated list of holiday deals through Cyber Monday 2017, on November 27, and beyond. Major online stores run special sections that are hubs of all the deals for this year’s Cyber Monday. If you have found the Cyber Monday 2017 deal that’s worth checking out and is not listed below, don’t hesitate to leave a short note on Facebook or Twitter. Thanks! Check out the deals that are offered for Kindle users who shop in the biggest Amazon online store at amazon.com. You can find Cyber Monday 2017 deals in Amazon’s stores localized in other countries as well (for instance at amazon.de or amazon.co.uk), but this overview would be too long if we wanted to list them all. This year, Amazon introduced only one brand-new e-reader, the premium Kindle Oasis 2 (the regular price is set to $249.99). 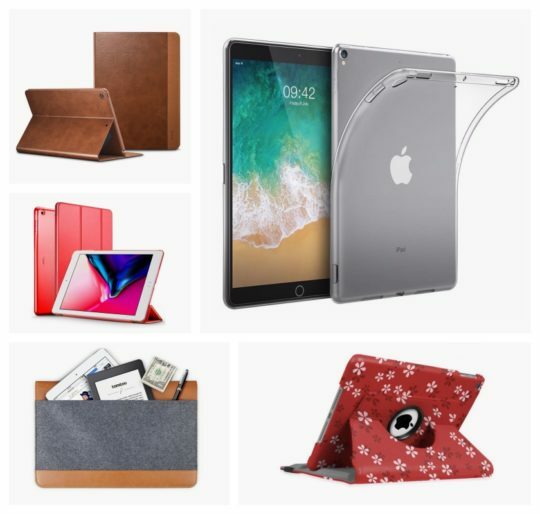 While you should not expect deals on the device itself, you can be sure you can save some money on Kindle Oasis 2 cases and accessories. If you want to learn more about how to save money in the Kindle Store, make sure to check out our complete guide to Kindle deals. 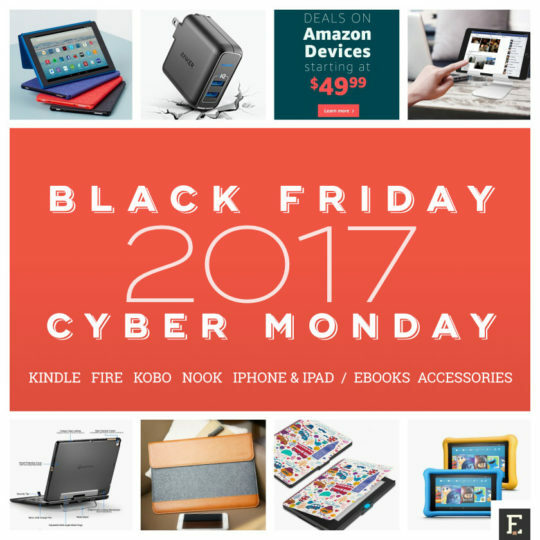 Amazon Cyber Monday 2017 Week lists all Kindle devices that are on sale, including bundles, and refurbished models. Below, you will see the most interesting deals. 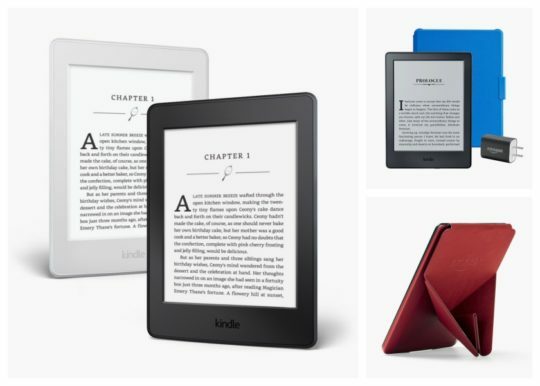 save up to 50% with refurbished and pre-owned Kindle devices – if you are hunting for good deals on devices that are not still not offered at reduced prices, checking out pre-owned models might be a good direction. In warehouse deals, you can find a growing number of Kindle and Fire models that are either certified refurbished or pre-owned. For instance, a previous-generation Kindle Oasis, worth $249.99, can be bought for $199.99. Below, you’ll see the deals on subscription-based services from Amazon. We are particularly interested in the deals on Kindle Unlimited and Audible membership plans. You can expect the biggest deals to arrive on Cyber Monday. At the end of this post, in our reference section, you will find out which deals were offered for Black Friday and Cyber Monday 2016. It’s what you can expect this year as well. 3-month free access to Amazon Rapids with Kindle Unlimited – since the end of october, if you subscribe to Kindle Unlimited, you will get get three months of an unlimited, free access to Amazon Rapids. It’s an innovative reading platform for children, offering entertaining kid stories that resemble a chat application. A monthly subscription of Amazon Rapids costs $2.99. When you visit Computer Accessories Store on Amazon and search for “Kindle” you will see over 45,000 results. More and more items are getting price cuts, even those which are not included in the official Cyber Monday 2017 catalog. The best thing to do is to decide which kind of product you need (for instance, a tri-fold case for Kindle Paperwhite, or a waterproof sleeve for the basic Kindle), and search the entire Amazon, not only the deals store. Obviously, the time you perform the search is crucial. The closer to the end of November the bigger the price cuts. 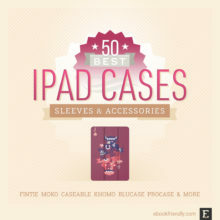 over 50% to save on MoKo Kindle Voyage smart-shell case – looking for the most affordable case for your Voyage e-reader? The best price is offered by MoKo for the slim and lightweight hard back design. You can save currently 50%, because the case is priced $13.99 instead of $29.99. 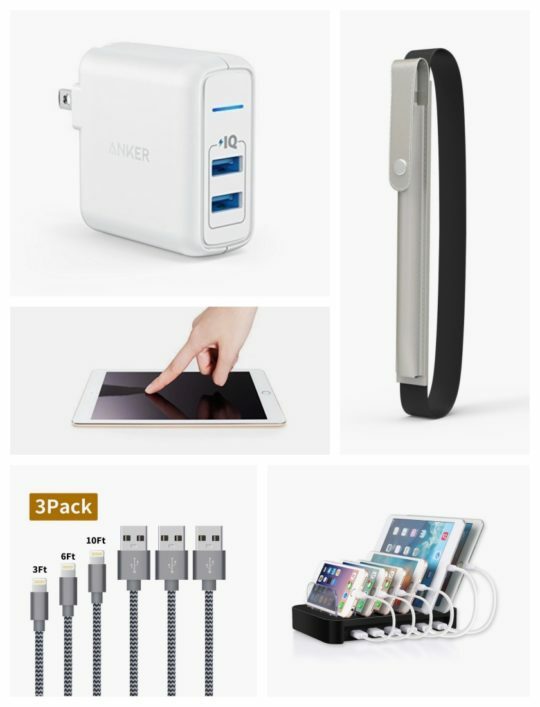 Are you interested in getting a charger for your Kindle? Do you want to give the Kindle’s display an extra protection and buy a tempered glass screen protector? We list the most interesting deals below. Most of them are not included in the official Cyber Monday 2017 directory. Again, it’s worth hunting for discounted products acrooss the entire store, not only going through the featured deals. Here’s what we’ve found for you! save $11 on Orzero tempered glass screen protector for Kindle Oasis 2 – your newest top-level Kindle deserves higher protection than any other Kindle you previously owned. A double-pack of screen protectors from Orzero costs only $8.99 instead of $19.99. Deals on Kindle ebooks are an important part of every Black Friday & Cyber Monday weekend. Actually, the price cuts for the Kindle content are continued until Christmas and beyond, and many new owners of Kindle e-readers and Amazon Fire tablets are hunting for the best Kindle ebooks to fed their new devices – and the price is an important factor in making a purchase decision. 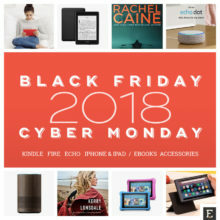 If you are going to check out deals on Kindle ebooks, do it on Black Friday (November 24) and Cyber Monday (November 27). On these days, the best and largest deals are guaranteed to be revealed. Let’s have a look at the Kindle special offers that are currently offered. Top deal: over 450 top Kindle books up to 85% off – we’ve been waiting for this deal all year long. 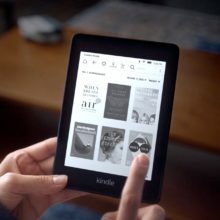 This gigantic list of Kindle ebooks offered at prices cut by up to 85% includes evergreen bestsellers and hot new titles. This deal is valid only on Cyber Monday, so hurry up and grab the titles you love until midnight! Ended 24.11: over 100 best-selling Kindle books, starting at $0.99 – have a look at an exciting Kindle Daily Deal that runs on Black Friday 2017 only. 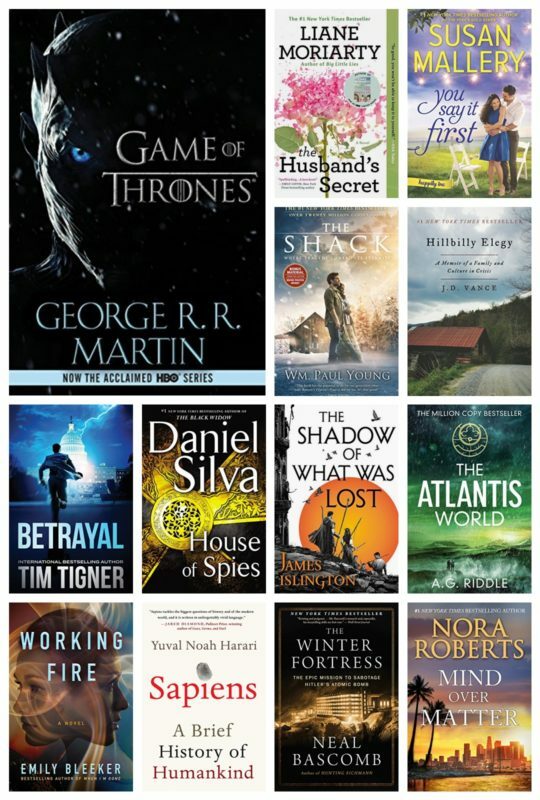 Over 100 best-selling Kindle books are offered at reduced prices, usually between $1.99 and $3.99. What can you expect? Books by Liane Moriarty, Joan Didion, Neil deGrasse Tyson, and Nicholas Sparks! Below, you’ll find deals on Amazon Fire tablets as well as relevant case covers and accessories. Fire HD 10 – an entertainment device that’s a combination of a tablet and Alexa voice assistant. List prices start from $149.99. 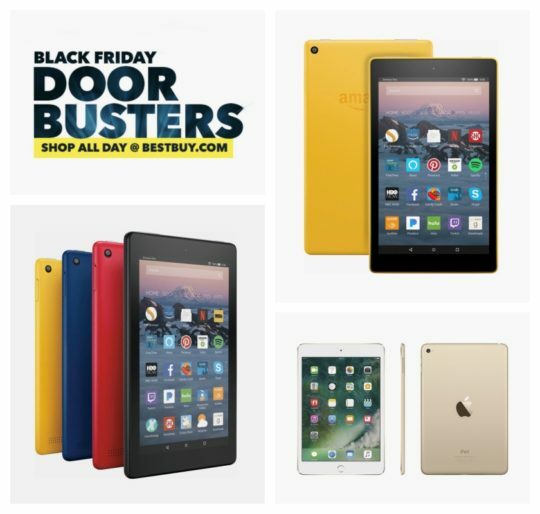 Since the beginning of November 2017, Amazon offers interesting deals on the newest Fire tablets. In the list below, we present all special offers we managed to spot, also the ones that are not included in the official Cyber Monday directory. 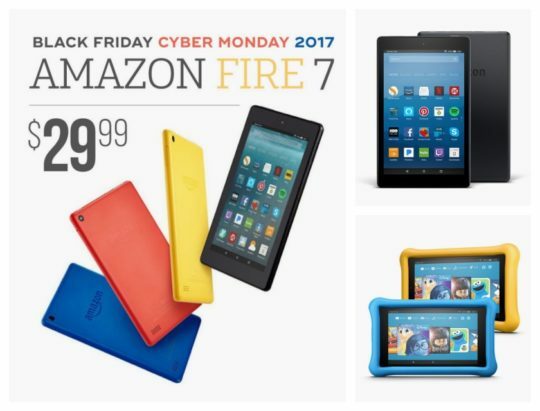 Fire HD 8 2015 available for $44.99 – Amazon Warehouse Deals: you can save $35 if you buy a pre-owned 8-inch Fire tablet with an HD display. Three colros are available: Black, Blue, and Magenta. The price is $44.99. If you plan to buy Amazon Fire 7 tablet, which costs $29.99, getting the case for the same price doesn’t seem to be a reasonable decision. Finding deals on good-quality cases for Amazon Fire tablets is reasonable. 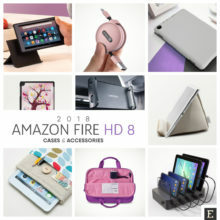 What you need to know is that Amazon’s official catalog of cases and accessories for Fire tablets includes a tiny part of what’s available in the entire store. What’s more, the covers featured here rarely get a price cut. 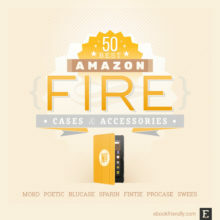 Therefore, we advise you to search entire Amazon store for Fire cases. It may return hundreds of thousands of results, so make sure to be as specific as possible in describing what you are looking for. We are continually browsing Amazon for cases and sleeves fitting the latest Amazon Fire tablets. The goal is to find good-quality models with deepest price cuts compared to their list prices. 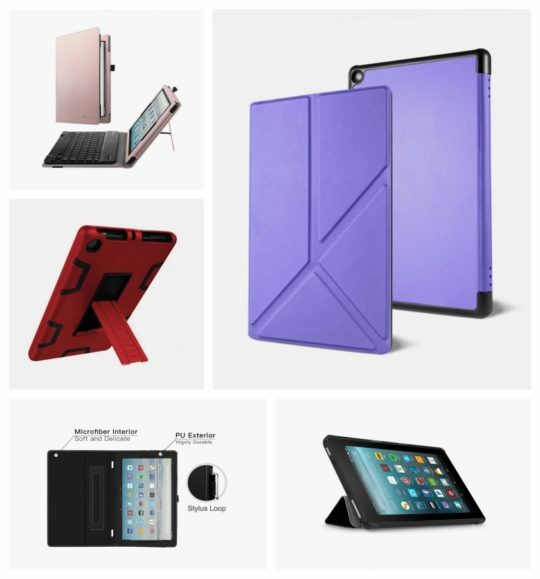 50% off heavy-duty kickstand case for Fire HD 8 – are you looking for a protector stand case for your 8-inch Fire tablet? One of the cheapest options is the one from Tianli. It gives three-layer shock and dust protection, and costs now $15.99 instead of $29.99. 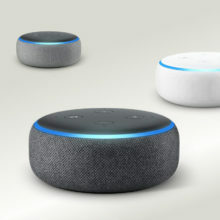 Gold Box, Amazon’s massive directory of current deals in all categories is a default way to find great products at deal prices. From our observations, however, we can say that there are a lot more items that are offered at reduced prices but don’t make it to Gold Box listing. Therefore, it is a good thing to search the entire store (and this applies to every online shopping website, not only Amazon) to search for products that are currently offered at lower prices. One thing to note: you will see the list price in search results pages, but when you move to the product detail page, the price reference won’t be displayed any longer. Below, you will find our recommendations found in Gold Box, Cyber Monday 2017 Store, and site-wide. save 70% on waterproof heavy-duty solar power pack – Hobest offers 12,000 mAh solar battery charger with dual USB. The charger is waterproof, has a built-in torch, and can be recharged under sunlight. Hobest has the deal for the charger – the price is reduced from $69.99 to $19.99. While the best place to buy Amazon devices is Amazon, you can’t say that about Apple. 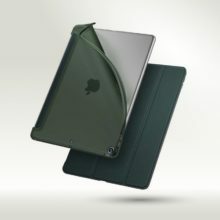 Apple’s online store offers a limited number of cases and accessories, and they are – as you well know – quite expensive. 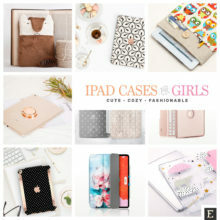 When you try to search Amazon, eBay, or Best Buy, you will quickly realize you can get a good-quality case for your new iPad – but at a considerably lower price than in the Apple Store. 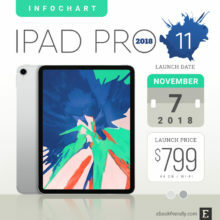 Apple iPad Pro 12.9 – you will find the similar features as in the 10.5-inch model, but the screen has a higher resolution – 2732 × 2048 px. The list price of the cheapest version, 64 GB + Wi-Fi, is $799. 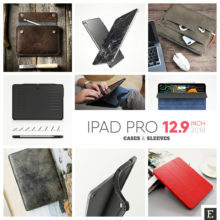 Below, you’ll find deals on iPad tablets, cases, and accessories. We are collecting them from Amazon, eBay, Best Buy, Target, Etsy, and Apple. You may, however, prefer to shop on Amazon – for instance, you get a free two-day shipping thanks to Prime membership. 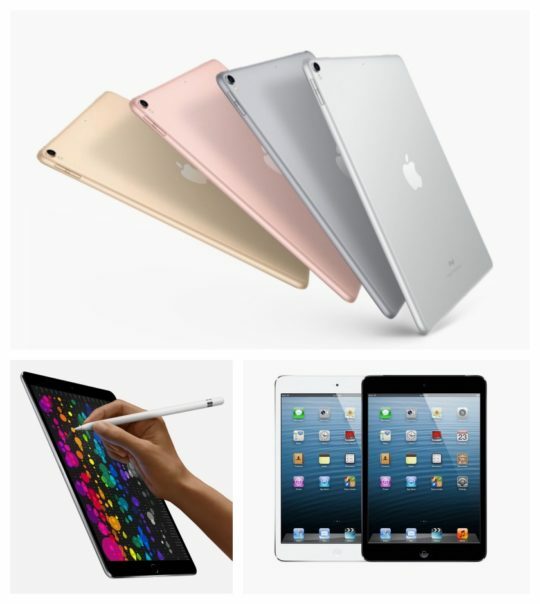 Good news is you can find discounted Apple tablets in the biggest online store, as well. Obviously, the first place to check out is the home page of Gold Box Deals which includes during this year’s holiday season a lot of Cyber Monday 2017 deals and special offers. However – and we keep repeating it every time we share deals we hunted on Amazon – there are a lot of discounted products that are not listed in any deal directory, but these deals can be extremely attractive. More and more items in online stores get price cuts. The closer to the end of November, the higher the discounts. However, not all deals are listed in official Cyber Monday 2017 directories. If you are looking for a deal on an iPad accessory, you can, first of all, check out what’s included in Cyber Monday directories. However, if you don’t find anything interesting there, don’t give up. Try to search the entire store – Amazon, eBay, Etsy, etc. – and be as specific as possible when writing down the search phrase. You may be surprised how many great accessories are now discounted, but hard to find. 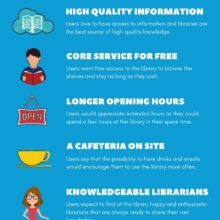 Just have a look at the recommendations we’ve got for you. There are so many great deals and special offers during Black Friday, Cyber Monday, and holiday shopping season in general that it’s hard to mention them all. Therefore, as we decided to focus on everything that relates to tablets, e-readers, and digital content, we will list the most interesting deals for Nook, Kobo, or Samsung Galaxy Tab tablets. You will find here deals not only on devices, but also cases, accessories, and digital content, including ebooks, audiobooks, or subscriptions. Best Buy has already started a store with Cyber Monday 2017 deals and offers, and you’ve probably missed great deals on Apple iPad already. What’s available currently in electronic deals? We’ve put together the best deals on our favorite devices. 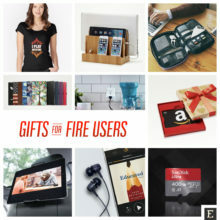 Besides iPad, you will see below Amazon Fire and Kindle – both the devices and accessories. save $200 on Apple iPad 9.7 (2017) with Verizon – the new 9.7-inch iPad with 32GB of internal memory, in Space Gray, and Verizon cellular network would cost you $459.99 but now you can get it for only $259.99. Samsung is one of the biggest producers of electronics, offering products in many categories. Sharing deals for Samsung electronics would be a separate post this long. 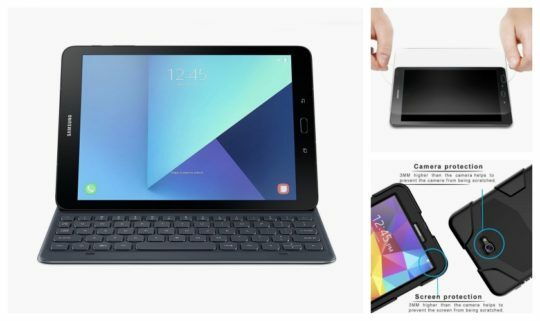 Therefore, we are narrowing down the deal search to everything that’s related to Samsung Galaxy Tab tablets – devices, case covers, and accessories. Take a look the best offers and highest price cuts from Amazon. 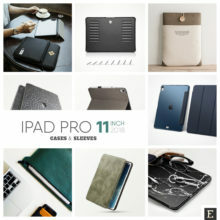 If you are looking for cases for any of the recent Galaxy Tab tablets, make sure to check out this extended overview. 2-pack screen protector for Galaxy Tab S2 for only $14.99 – you can save huge on the tempered glass screen protector from Spigen. It features 9H level screen hardness and supports Samsung’s S Pen. The pack of two costs $14.99, which is a 65% discount from the list price of $42.99. Before going to Barnes & Noble physical store in your neighborhood, you can check out Cyber Monday 2017 section of B&N’s online store and find which products are or will be offered at reduced prices. 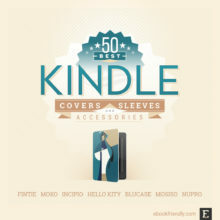 Below, you’ll see a round up of the special offers, price drops, and deal sections that relate to Nook. 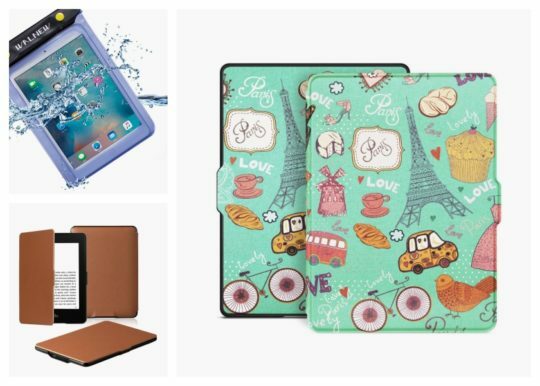 save up to 25% on Nook accessories – if you decide to buy Nook e-reader or tablet this holiday, you will most probably be also interested in getting a proper case. Wait for Black Friday & Cyber Monday weekend and check out the online store, as some of the accessories will be discounted by even 25%. Kobo is usually slower is releasing special promotions during the pre-Christmas shopping season. Everything that’s worth checking out will land in the updated list presented below. 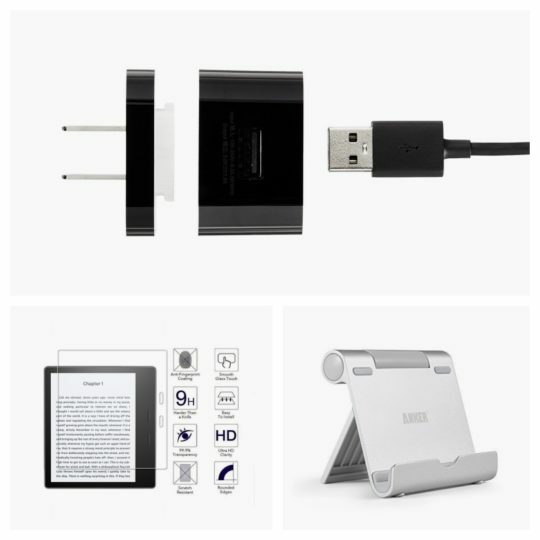 Besides deal sections of the Kobo store, we are presenting the current deals, price cuts, and special offers. 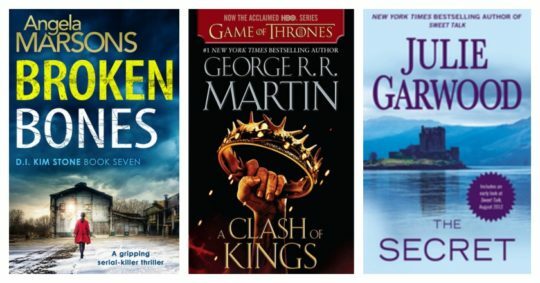 great Kobo reads under $5 – this is an ongoing deal section of the Kobo store. You’ll find on the list hundreds of ebooks in popular categories. Some of them – but not too many – are current bestsellers. If you are going to catch some good Cyber Monday 2017 deals on eBay, make sure to browse the section with the best tech deals. You can get the deepest deals on previous-generation Apple iPad models, but current devices are also discounted. Let’s take a look. save $70 on Samsung Galaxy Tab A with S Pen 9.7 – the 9.7-inch Galaxy Tab A with Wi-Fi connection and 16 GB on board costs usually around $300. Now you can grab it on eBay for $227, which is a saving of $70 (24%). The tablet offers the display with a resolution of 1024 × 768 px. A microSD card slot enables the user to expand the memory by up to 128 GB. 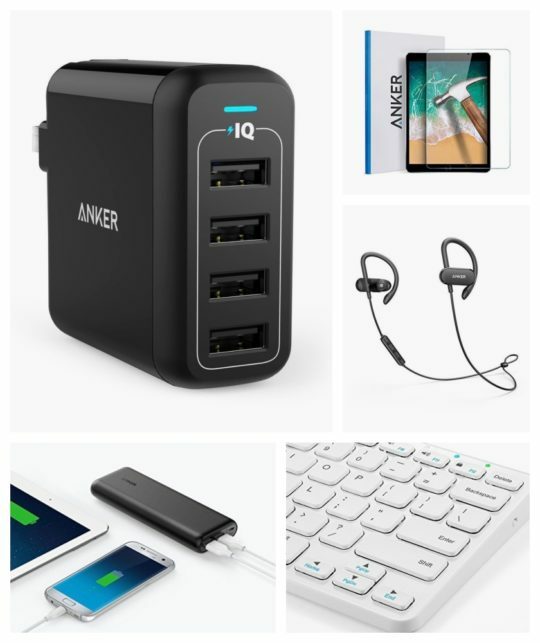 If you are hunting for deals to give your tablet or e-reader an extra boost of power or functionality, you should check out what Anker offers right now. Price cuts are as deep as 75%! Cyber Monday 2017 – what to expect? What to expect from Black Friday and Cyber Monday 2017 sale? If you don’t like to guess, you can always find out how deep were price cuts in the similar period last year, or during other huge shopping event, such as Prime Day. Below, we present the best deals offered in the past for Kindle and Amazon Fire devices, plus related services such as Kindle Unlimited. Prime Day is a shopping event addressed to subscribers of Amazon Prime multi-benefit program. In 2017, it took place on July 11, but the deals were offered already a few days in advance. $100 off Kindle Paperwhite Travel Bundle – the bundle was priced $169.96 during Prime Day, instead of $269.96. It turns out the deals offered during Prime Day 2017 were more attractive than last year’s Black Friday & Cyber Monday. 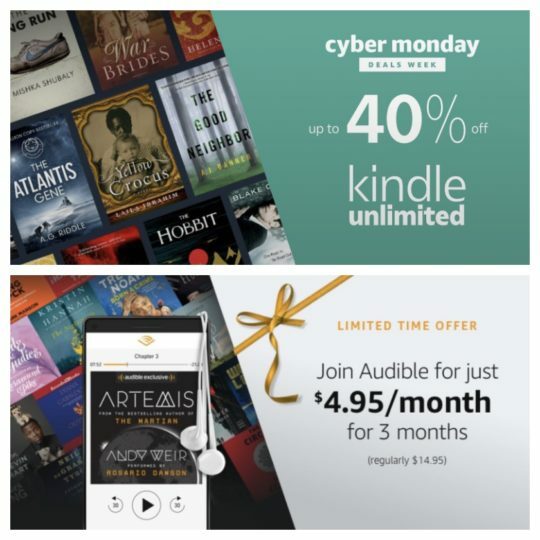 up to 40% off Kindle Unlimited – the usual deal for Kindle Unlimited pre-paid plans. The highest discount of 40% was offered on the 24-month plan. The deal price was $143.85, instead of $239.76. 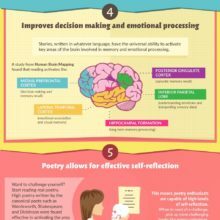 Was this overview helpful? You can get new lists like that. Get free updates by RSS or email. We are also waiting for you on Facebook, Twitter, and Pinterest. Want to see more deals offered this holiday season? Make sure to follow #BlackFriday2017 and #CyberMonday2017 tags on Twitter.